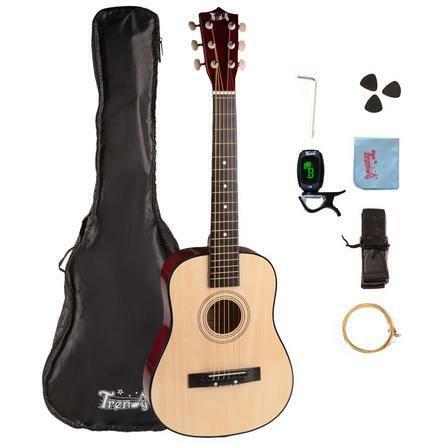 Children Beginner Steel String Acoustic Guitar Package Only $53.95! Down From Up To $105.99! You are here: Home / Great Deals / Children Beginner Steel String Acoustic Guitar Package Only $53.95! Down From Up To $105.99! Sears has this Children Beginner Steel String Acoustic Guitar Package on sale for $53.95 (Reg. $105.99)! Constructed from high quality materials: linden plywood for the top, back and sides. Well constructed body give a good tone & a comfortable action. Easy Playablity,Ideal Beginner’s Instrum. With smaller scale length , it’s great for beginners or players with smaller hands. Accessories include everything to start, waterproof gig bag, E-tuner, extra set of string, 3 picks and polishing cloth. For ages 5 and up.